Unlike most reviewers, I don’t do a year-end “best of” (I leave that to what we’ve created for the Circle Awards in March). I like to hit upon unusual events, observations and stream-of-consciousness feelings that I come upon after reviewing this past year in local theatre. Unfortunately, I was hindered a bit by my wife’s multiple surgeries and subsequent care-giving status on my part. So I missed a lot of shows- particularly during the summer- so my take on 2014 may be short and sweet. “Blithe Spirit” at St. Louis Actors’ Studio. Red Carpet At NJT: The dynamic production of “The Diary of Anne Frank” at New Jewish Theatre brought out a host of local talent in the audience. It was really a red carpet moment as actors, actresses and technical folk from St. Louis theatre streamed into opening night to see their peers bring us an unforgettable production. 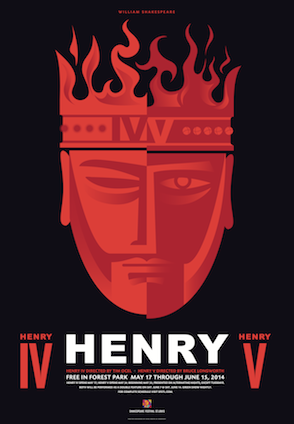 Now, there are usually a fair amount of actors not currently in a production supporting the other productions, but opening night at NJT was rife with incredible talent as audience members. I chatted with a few including a rare sight- Emily and Aaron Orion Baker sitting in the audience together! Can you believe neither were on stage at this unusual moment in time? Probably just a night off from rehearsals, though. A New Christmas (Carol) Tradition: For the second year in a row, Deanna Jent at Mustard Seed Theatre has brought us the moving, beautiful a cappella musical, “All Is Calm.” Ten men with soaring musical voices recreate the stunning “peace” during World War I when Allies and Germans dropped their weapons and met to greet each other as people, not soldiers. This could become their seasonal “A Christmas Carol,” although Deanna has said it will not be performed next year, but watch out for 2016! 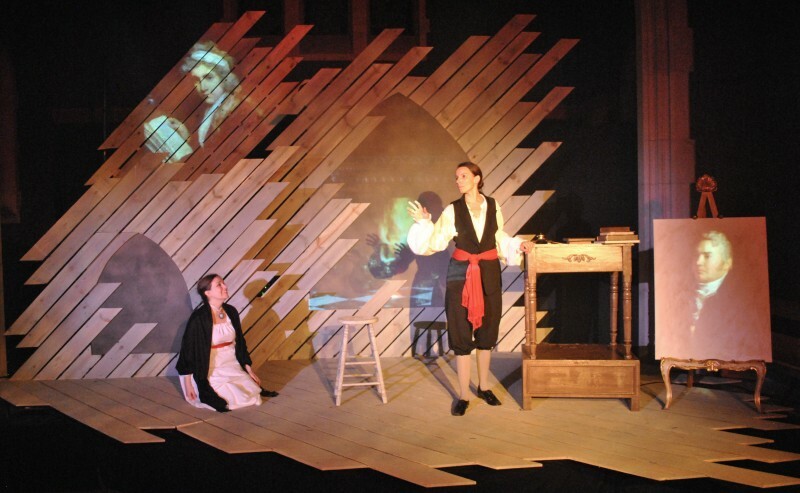 “Mary Shelley’s Monster Show” at Slightly Askew Theatre Ensemble. First Timers: As most of you may know, I’m a musicals fanatic. With tons and tons of cast albums, I’ve listened to most multiple times over the years and wished I could have seen them live. Local companies continue to grant my requests (though they never ask me for ideas!) by producing local premieres. New Line usually leads the way and they did this year with an outstanding production of Frank Wildhorn’s “Bonnie & Clyde.” They also did “Hands On A Hardbody” but that was during that “summer of missed shows” I experienced. Never mind, R-S Theatrics accommodated me with “First Lady Suite” and Insight Theatre Company did the same as I viewed “The Spitfire Grill” for the first time. Thanks to you all and to those who brought back musicals I haven’t seen produced for a very long time as well. The company of Stephen Peirick’s “Four Sugars” at Stray Dog. 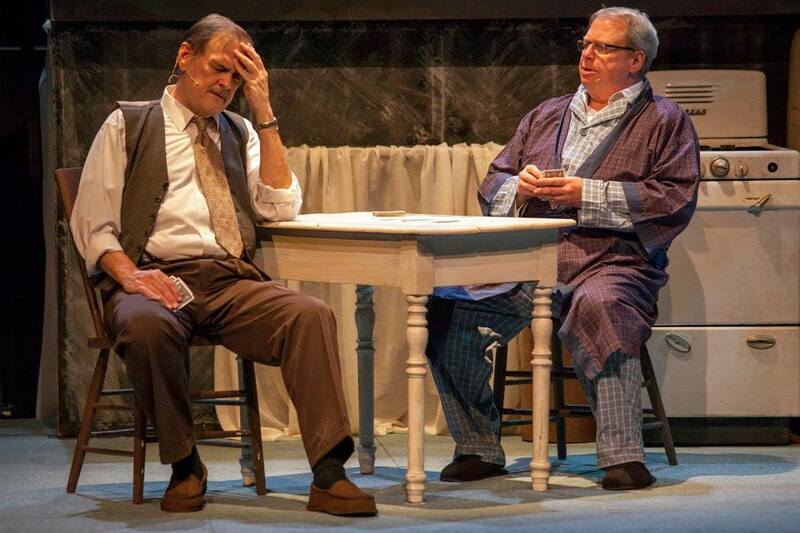 “Death Of A Salesman” at Insight Theatre Company. “And Every One Was An ‘Enery”: Who doesn’t burst into joyous song when they hear the Herman’s Hermits hit from the 60’s (actually a British music hall staple from 1910), “I’m Henery the Eighth I am?” This season, the St. Louis Shakespeare Festival in Forest Park took on two other Henry’s- Shakespeare’s “Henry IV” and “Henry V.” A delicious two night immersion into these epic dramas brought this popular summer series to new heights. Now we have “Cleopatra” to look forward to. Unfortunately, there’s no Herman’s Hermit song that comes close to accompany that one. 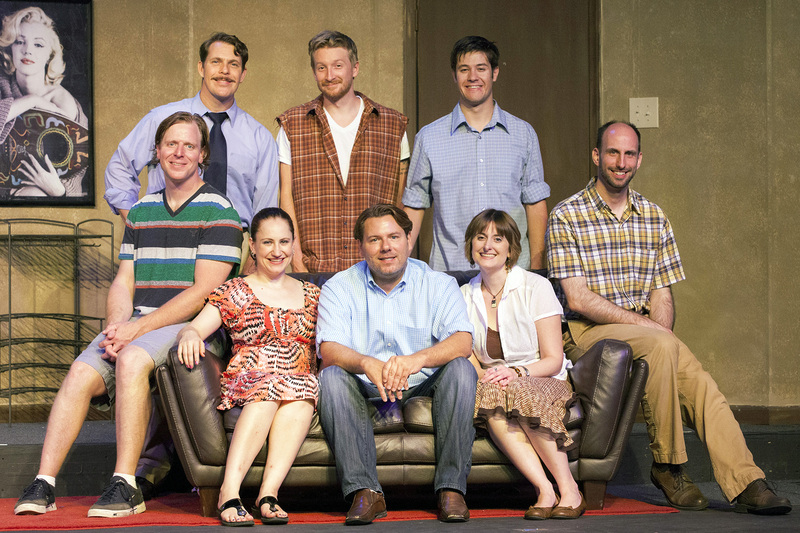 Trailer Trash: This year we had two versions of the vulgar, rude but highly entertaining “Great American Trailer Park Musical.” After Stray Dog presented the original a couple of years ago, Dramatic License took it on this season. We got to relive the Jerry Springer-like lives of Pickles, Linoleum, Betty and the rest of the gang once again. But then Stray Dog led us on another “merry” chase through Armadillo Acres as they presented “The Great American Trailer Park Christmas Musical.” Just as wild, wacky and totally unwholesome as the original, it makes you wonder what would happen if Henry Higgins arrived in Florida and attempted to make them all princess for a day. 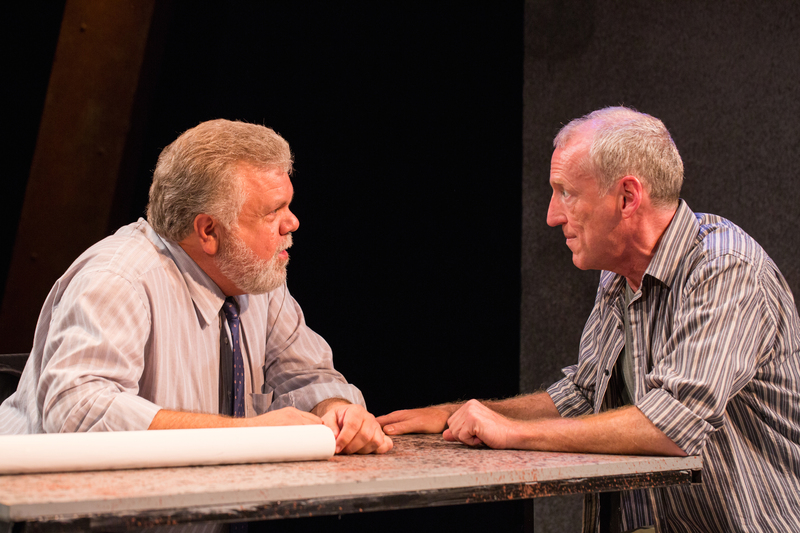 “The Normal Heart” at HotCity Theatre Company. 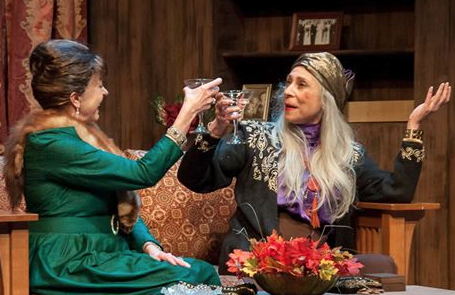 Old Favorites Redux: Quite a few old favorite plays and musicals sprang into life again this season as several companies went “old school.” Most recently was the brilliant production of “Blithe Spirit” at St. Louis Actors’ Studio which brought back the Noel Coward sophistication of the 40’s. West End Players Guild revived one of my favorites from long ago, “Lovers: Winners and Losers” by Brian Friel. This gentle recreation from the famous Irish playwright was a treat. Teresa Doggett charmed us with “Shirley Valentine” at Dramatic License and Stray Dog brought back the Agatha Christie thriller, “And Then There Were None.” A brilliant production of the Arthur Miller classic, “Death Of A Salesman” was a highlight at Insight and the aforementioned “Diary Of Anne Frank” brought tears at New Jewish Theatre. New Jewish also presented their own production of last year’s big winner at the Circle Awards for the Black Rep, “The Whipping Man.” Harold Pinter’s “The Homecoming” was a searing presentation at STLAS and HotCity Theatre reminded us how gripping and relevant “The Normal Heart” remains after all these years. The Muny always brings us classic musicals but several other theaters brought us classics as well- “Cabaret” lit up Stray Dog and Stages brought us “How To Succeed…” and “Fiddler On The Roof in stunning fashion. New Line brought a new look to “Rent” and the new kid on the block, the November Theatre Company, made us enjoy Sondheim’s “Assassins” again in their spectacular premiere production. 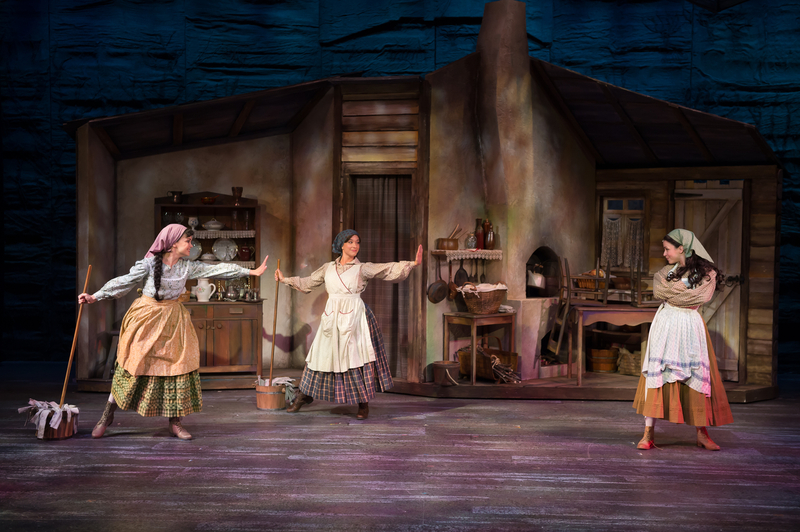 “Fiddler On The Roof” at Stages. Another Premiere: 2014 will also be remembered for the world premiere of a Tennessee Williams play by the premiere presentation of Sudden View Productions. Their enigmatic but beautiful presentation of “Stairs To The Roof” still haunts the theatre-goers who were lucky enough to attend this wonderful event. Good Bye Old Friend: We’re not just losing a powerful theatre company with the final season of HotCity- we’re losing the memories of three powerful companies. It all started with City Players under the guidance of Irma Schira Tucker and her son Gerard. They were innovative and brought new pieces, local playwrights and old favorites to their season after season of quality productions. Who remembers the humble, often awkward appearance of Gerard post curtain pleading for support for City Players? He was a kind and generous man and Irma was a true bastion of the theatre community. Then it evolved into HotHouse Theatre and finally, for the past ten years or so, HotCity Theatre. We miss you all and will always cherish the footprint you all left on our glorious city. Happy New Year: Despite the sad news from HotCity, we still have a thriving theatre scene in our town. 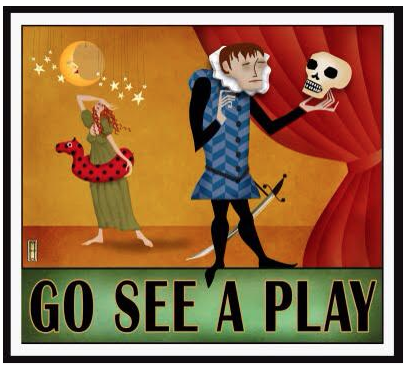 Let’s get out there and support local theatre in 2015. From the established companies to the crop of newbies to special projects such as Em Piro’s unique Fringe Festival, we have a lot to be thankful for from 2014 and so much to look forward to in the year (and years) ahead. Thanks for reading and, as always, I welcome all comments (good and “scolding”) throughout the year. This entry was posted on December 27, 2014 at 9:43 am12 and is filed under Uncategorized. You can follow any responses to this entry through the RSS 2.0 feed. You can leave a response, or trackback from your own site.